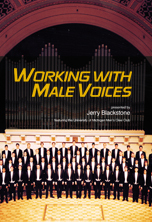 DVD: Working with Male Voices presented by Jerry Blackstone | Santa Barbara Music Publishing, Inc.
Music-based choral tone: repertoire and the musical challenges inherent therein determine the vocal precedures needed to communicate the composer's intent. Tone and the singing male: beautiful/appropriate choral tone; warm-ups; rehearsals of works which utilize different timbres and which present particular challenges for the singing male, such as tessitura, register changes, and vowel color. Voice classification: what does one look for and hear when deciding in which sections singers should be placed? Tonal consistency throughout the range-a particular problem in men's voices: warm-ups with the group which deal with the problem; demonstration using pieces in which consistency is problematic, particularly as it affects intonation. Intonation issues (probably the biggest issue for untrained singers): discussion followed by a demonstration of warmups and rehearsal techniques which help. Rehearsal procedures: using head voice, or falsetto, is highly effective in dealing with intonation issues and in introducing foreign languages. Communicative choral singing: what makes a particular performance "moving" or "exciting"? Live performances: starting with warmups, then progressing through an initial rehearsal, a rehearsal later in the process, and then a live performance to demonstrate what has been discussed; examples for playback in classroom situations.